Konnichiwa from the land of Japan! As you know I'm super excited for my first trip to Japan and after spending few days with bloggers, it was such an enjoyable trip! I'm still half way through my first Japan trip but there's something I wanna share with you today. Since I get to meet Cheesie and Chanwon up close and spent a few days with them, I've noticed their skin is like pika-pika (Japanese slang for shiny) and super smooth. And seriously that made me very envy of their skin conditions because I'm always facing some skin issue such as oilyness, dull, back acnes and such. It is so hard to take care of my own skin and I kinda wanna give up already. With 2 brush heads, I get to allocate different brush head for head or body usage. 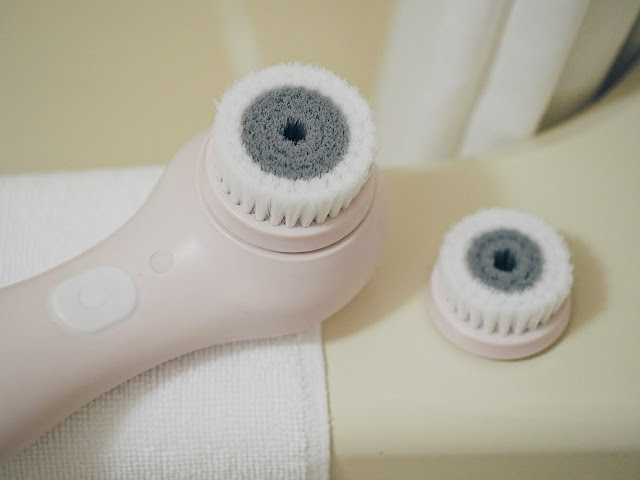 Programmed with an upgraded motor system, this cleansing brush cleanses even though pressure was applied and don't worry, it won't damage your skin as it rotates in a very gentle way so for me, I do think that apply pressure on skin is very important. While the rotating is gentle to skin, with 8800 rotation per minute it can easily remove dirt and grease from my skin with a relaxed-massage-like kind of feeling that can feel a bit ticklish if pressure wasn't apply on. lol. There's also 2 minute function settings for your timing needs to focus cleansing each and every area of my body and face and there's a 20 seconds pause for user to change skin area. I like the low speed function because I love how relaxing the touch is of the cleansing head brush rotating on my skin. I can totally relax and just move the brush around one section of my skin to cleanse it. Since there's 2 brush heads, the smaller ones gentle massage the skin, removes excessive oil and dead skin cell for better skincare product absorption while the bigger brush can unclog pores and cleanse away dirt on skin. Such a convenient cleansing experience with more exfoliating effect. Then while I cleansing my skin, I was thinking: will I get electric shock from this cleansing brush? Then after looking up product description and user reviews, only to find out this cleansing brush has IPX7 Waterproof level which means it is 100% waterproof hence it is totally fine to bring this into shower/bath tub without worrying of water immersion. Combine Sunmay cleansing brush with my onsen session, I really think I'm having the best skin condition in Japan right now as the weather doesn't make my skin too oily/too dry, and every dirt and impurities are literally clean off with the brush so when I apply skincare products on my skin it absorbed super fast. With USB power adapter, recharging for this device is super easy and the set comes with a travel pouch for easy storage hence I'll love to bring it around whenever I travel. Thank you Sunmay, now I can look forward owning flawless skin like other bloggers soon too!